Order half of a Berkshire hog through Penn's Corner! Hog Shares are available again! If you desire the convenience of having pork in your freezer, then a half hog share is a great option! Every couple months we sell hogs by the half. The deadline to reserve a half hog for this round is April 19th, 2019 for pick-up from our warehouse in late April/early May. Contact orders@pennscorner.com if you are interested in a half hog share! A $200 deposit (check or card) will be required to reserve your order and the rest can be paid upon pickup. Logan Family Farms and Pleasant Valley Swine raise a heritage breed of hog called Berkshire, which is one of the oldest breeds of pig and can be traced back over 350 years! The meat from this breed is very high quality and is valued all around the world by restaurants and consumers alike. Are kept on organic pasture and in an uncaged barn. Get most of their food from grazing the pasture, and are supplemented with GMO-free local grains. If you've already ordered pork from Clarion River Organics on our online Farm Stands, then you've tried Jonas’ pork! Kept on organic pasture and in an uncaged barn. Fed with home grown feeds; no added antibiotics, hormones or growth stimulants. Grown at their own pace. Harvested under USDA Inspection, at a local USDA Inspected Facility, with no added tenderizers or additives in the pork. The price of your hog share is based on the weight of the hog after harvesting. The price will be about $3.98/lb for the hanging weight of the hog. The total cost can vary depending on the type of cuts you request. Most of the halves have a hanging weight between 125 and 150 pounds, so you could expect to pay around $537 total (the average price for a 135 lb side). Please note that the hanging weight is not the final weight after cutting. You can expect to receive about 75% of the hanging weight. If you have a preference for the size of your hog, please let us know. A $200 deposit will be required upon placing your order, and the rest can be paid in full upon pickup. We accept card or check. Pick-up from our warehouse (Penn’s Corner Farm Alliance in Upper Lawrenceville at 150 54th Street, Pittsburgh PA 15201) in late April/early May. Click here to put down your $200 deposit today! Deposits can be made online from Mondays at 1pm through Fridays at 12pm, during the Farm Stand order period. If you are paying by check you can mail it to Penn's Corner Farm Alliance at 150 54th Street, Pittsburgh, PA 15201. We will then reach out with a form for you to indicate what cuts you prefer. Or, complete that today by filling out the Hog Cut Preference Sheet form linked here! The pork fat is available upon request, as well as the tongue, liver, bones and heart. The ham and bacon can be uncured upon request. All cuts will be vacuum sealed or wrapped and frozen after butchering. Check out this helpful article from Modern Farmer about pork cuts, including what part of the pig they come from, and how to cook them! 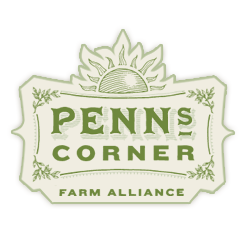 Contact farmstand@pennscorner.com if you are interested or would like to learn more information. We look forward to hearing from you!